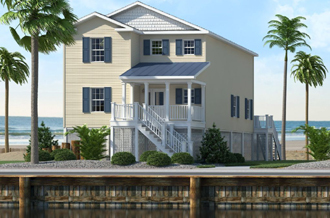 Q: Are modular homes built like a site built house? A: They are built using the same construction codes and materials as a site built house but the structure must be made much stronger and more rigid to withstand the journey from the factory. This is accomplished with the use of glue and screws in the construction process. Q: Are these homes built to hurricane standards? A: Our homes are built to the applicable building/wind code. In most cases this means they are built to withstand sustained winds of 120-130 mph. In a study done in Florida following hurricane Andrew, modular housing outperformed both HUD and site built housing. Q: How thick are the exterior walls on the homes you build? A: All exterior walls are built using 2x6 studs which not only makes the wall stronger but also allows the use of R-19 insulation. Q: Does your price include set up and foundation? A: Yes. Our quoted prices include a completed home on your site, excluding variable expenses such as well, septic/sewer, lot preparation and permits. A detailed list of what is included in our price is available from your sales associate. Q: Do you provide "Turn Key" Packages, or will I have to perform some of the work myself? A: Yes. We will provide "Turn Key" Packages where you can do as much or as little of the work as you would like. Q: Can I make changes to an existing floor plan or even design my own? A: You can design your own floor plan within limits. However, we suggest you stay with one of our many proven designs and make changes, if necessary, to suit your individual needs. 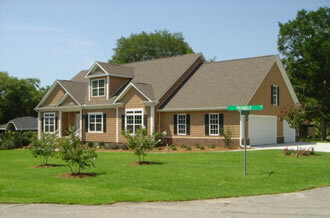 Q: Do you build garages, decks and porches? A: Yes. We have a very experienced "in house" construction crew that can add any kind of addition you require and match it to the house. Q: What kind of heating and cooling system will be provided? A: Our standard is a package heat pump with a 14 S.E.E.R. rating. (Seasonal Energy Efficiency Rating) Most any style heating and cooling is available as an option. Q: What is the time frame to complete my home? A: Construction time can range from six weeks to six months. The variables include, but are not limited to: backlog, weather, loan commitments and closings, plan review by controlling municipalities, complexity of the project, and availability of materials. Time estimates are given on a case by case basis. When we know your needs we can give you an approximate time to complete. Q: What kind of financing is available? A: Our homes qualify for conventional mortgage financing. Most of our customers choose the 30 year, fixed rate option. Q: What kind of warranty comes with your homes? A: The Modular home and its various components are warranted for a period of 1 year from the time it leaves the factory. All additions or work performed by South Bay Developers is warranted for a period of 1 year from the issuance of a Certificate of Occupancy. Q: How long should my home last? 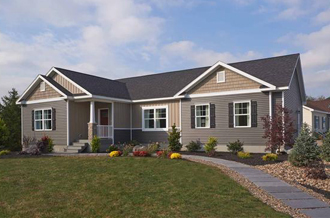 A: With reasonable care the life expectancy of your home will be the same as a similar site built home. Q: Can I visit the factory where the homes are built? A: We strongly encourage our customers to take a plant tour, if possible. We would be happy to make arrangements for you to do so. It is a fascinating experience and will answer a lot of questions about why modular homes are such a great value.